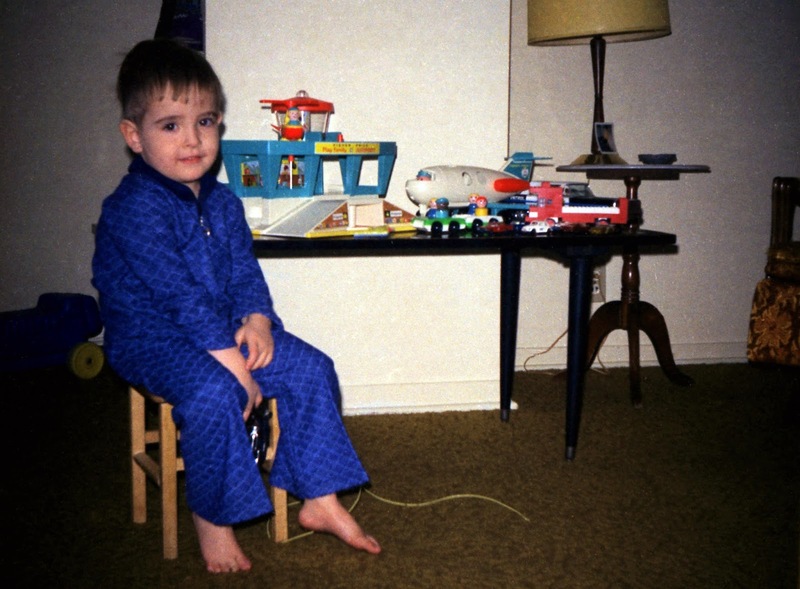 Here I am sometime in the early 1970s with one of my favourite toys: the Fisher-Price airport set. What fun I had sending the little people on their imaginary journeys and bringing them home again. There's something interesting about this shot: there's a photograph leaning against the base of the lamp in the background. Even at maximum resolution you can't make out who's in the photo, but you can tell that it's a close-up of a single person. Maybe the negative of that print is somewhere in my files, yet to be scanned. It's almost meta. Great galloping ghosts! I had the same Fisher-Price set! Just the airplane is worth a small fortune now. I loved that set, which is why I'm now so torn up that the stewardess is flying the helicopter and the red hat fuel tender driver is running away with the blonde. Maybe they're on an undercover mission? Please say they're on an undercover mission.